List of events that occurred in Saida between March 2012 and June 2013 involving Ahmad Al-Assir, Hezbollah and the Lebanese Army. March/April 2012 Ahmad Al-Assir started organizing rallies in support of Syria’s opposition against Bachar El-Assad. May 2012 The Sunni cleric preached in the name of religion to attract more followers to his anti-Hezbollah speeches. June 2012 His first speech criticizing the Syrian president, denouncing the massacres and describing Russia and Iran as “criminal killers who drink blood”. July 2012 He started his anti-Hezbollah sermons, insulting Sayyed Hasan Nasrallah and MP Nabih Berry, citing an Iranian project to rule Lebanon. August 2012 Al-Assir welcomed Fadel Shaker to his movement as a way to gain more popularity among the Lebanese and Palestinian Sunnis. The former pop singer gave the protest and sit-ins an added value to Al-Assir by humming religious songs. December 2012 Hezbollah leaders saw the presence of Al-Assir as a possible threat for the future of Saida and the surroundings; and decided to install a surveillance team near his headquarters to watch his movements. The team was installed in uninhabited apartments owned by the party of God. Their presence was soon mentioned by Al-Assir in his speeches, hoping a rise of the Sunni people against them. January 2013 Due to the weak response from the Sunni community, Ahmad Al-Assir tried to sympathize with other confessions in Lebanon, in instance Christians; and decided to organize a Sunday trip with 300 of his followers to the very busy ski resort of Faraya Kfarzebian. He thought that by his move he could bring Christians who are opposing Hezbollah’s politics under his wing. The welcome was not as he expected, people from the mountain area closed roads in protest of his provocative presence. Feb/Mar 2013 During these two months, he started reinforcing his headquarters, getting funds from Arab countries and other Lebanese figures, purchasing weapons from Palestinians and other Free Syrian Army agents (a suspicious role of the ISF was also mentioned). In March, he was seen for the first time wearing a special forces outfit and holding an AK47, and staging a video scene about the danger of Hezbollah’s flats in Abra. April 2013 Al-Assir announced the formation of armed groups to fight in Syria as a response to the recent rumors of Hezbollah’s implication in the Syrian conflict. Once he was well armed, he escalated his speeches against Bachar El-Assad, Hezbollah, Al-Hariri family, Michel Aoun, and the Lebanese army. He even pretended going to the Syrian city of Qusair to help the rebels. May 2013 All this time, the Lebanese army and the Hezbollah watchmen were able to collect intel about Ahmad Al-Assir whereabouts, his arsenal, his followers and a detailed map of the area. Their information reached the top command, warning them of the danger of Al-Assir and his plan to build a small army. In June, Ahmad Al-Assir organized a sit-in in the street of Saida exposing the presence of Hezbollah in the apartments and gave a public ultimatum to clear them out by Monday June 24th. Hezbollah and the Lebanese army got the message that something big was going to happen. On the morning of Sunday June 23rd an armed convoy consisted of Al-Assir men headed to the building where are located the Hezbollah apartments. Before reaching their destination, they were halted at a Lebanese Army checkpoint with their fully loaded arsenal. Eventually they didn’t respond to the Lebanese Army who summed them to stop and hand over their weapons. The armed men took the Lebanese Army by surprise and killed four soldiers on the spot. That was the moment everybody feared but expected. Al-Assir men immediately left the scene and took back positions around the Abra headquarters. The Lebanese Army had to quickly counter-attack to avoid the assailants from getting organized and reinforced. The army suffered many casualties in the first hours, due to snipers located on the main road leading to Al-Assir’s headquarters. That didn’t prevent the soldiers from taking over key positions allowing them to encircle Abra in no time. On Monday, the Lebanese Army was quickly gaining terrain with the retreating and surrender of the thugs. By Tuesday June 25th, it was all over. The Lebanese Army took over Al-Assir’s headquarters and the villa of Fadel Shaker. The previous collected intelligence was very decisive in the course of the battle. No civilian casualties and no religious monuments were targeted. The road leading there was turned into a military base by Al-Assir, with blocks of cement, barbwires, surveillance hunts. The booby-trapped buildings contained a heavy arsenal of light & medium weapons, explosives, personal mines, military gear and other combat equipments. But no sign of the cleric or his fellow singer. Many rumors emerged on the disappearance of Ahmad A-Assir, some say he left Saida few hours after the assault on the army checkpoint and is now safe in Syria, other believe he sneaked out disguised as a veiled woman heading to the nearest Palestinian camp (Ain El-Helweh or Miyyeh w Miyyeh). While other say that he’s still in the area above Saida, hiding in caves before trying to reach the Syrian border. 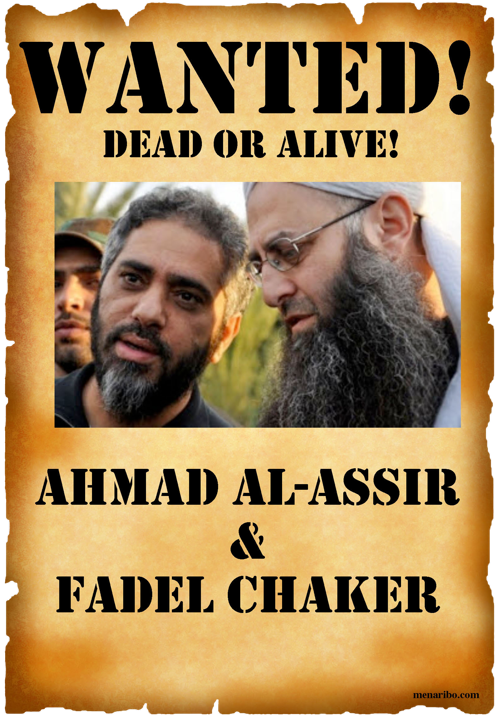 One thing for sure, Ahmad Al-Assir and Fadel Chaker will remain a threat to Lebanon until the day they’re brought in, dead or alive.